Last month, US Senators Patty Murray and Maria Cantwell, Port of Seattle CEO Tay Yoshitani, and Port of Tacoma CEO John Wolfe held a press conference at the Port of Seattle to announce proposed legislation they claim will significantly strengthen American ports, including many in the Pacific Northwest. Their legislation proposes to eliminate the harbor maintenance tax (HMT), a federal tax imposed on shippers based on the value of the goods being shipped through ports. The tax is intended for the maintenance of federal navigational channels, but while HMT revenues are about $1.6 billion per year, only $850-900 million per year is spent on harbor maintenance, leaving waterways under-maintained while building up a surplus approaching $7 billion. The American Association of Port Authorities (AAPA) says the lack of funding has resulted in full channel depth and width only being available about 35 percent of the time. The HMT has also been blamed for the rerouting of cargo from Pacific Northwest ports to Canadian ports in Vancouver and Prince Rupert, BC. Those ports are maintained with a different funding mechanism, and are able to avoid the roughly $110 per 40-foot container paid into the HMT by US-bound carriers. The Harbor Maintenance Tax and its disadvantages are well documented, and this editor would not hesitate to characterize the dislike of the HMT as universally bipartisan. 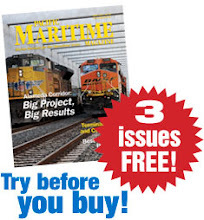 While the Maritime Goods Movement User Fee is a good start toward a discussion about removing or revising the HMT, using legislation such as this as a cudgel to collect more taxes from oil and gas companies sounds less like the strengthening of US ports and more like an early Senate re-election campaign. Senator Cantwell’s office said the legislation has not been formally introduced to the Senate, and therefore the text of the bill wasn’t available at press time, so there is still time to rewrite the bill to reflect the needs of the US commercial maritime industry as a whole, without adding unnecessary partisan rhetoric. We hope Senators Murray and Cantwell will reconsider the anti-oil language and write a bill that will gain the support of both sides of the aisle.